Doug and Joanne Cummins of Williamstown, announce the engagement and forthcoming marriage of their daughter, Andria Cummins to Tyler Mullins, son of John and Kathy Mullins of Dry Ridge. 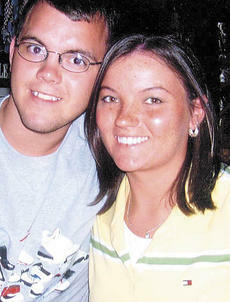 The wedding is being planned for 4:30 p.m. on Oct. 18, 2008 at Williamstown Baptist Church. A reception will follow at the JMB Hall in Dry Ridge. The bride is a 2004 graduate of Williamstown High School. She is also a 2006 graduate of Southwestern College. She is employed by Summit Medical Group in Williamstown. Clifton Webster and Kathleen Lawrence were married on Oct. 17, 1942, by Rev. George Smith near Georgetown. Jimmy Whitson and Mrs. Smith were their witnesses. They currently reside in Knoxville. The couple has three children, Lawrence Webster of Buffalo, Ny., Katsia Baird of Mount Zion and Ricky Webster of Florence; five grandchildren and eight great grandchildren. Harry (Pete) Spegal and Eunice Lawrence were married on Oct. 25, 1952, by Rev. W.F. Brosend in Lawrenceburg, Ind. Willard and Joyce Slade were their witnesses.